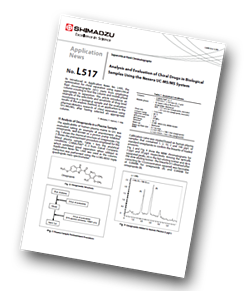 This article introduces an example of the selectivity and sensitivity of drug level monitoring in a biological sample and the evaluation results of the analysis method, as an application to the pharmacokinetics research of chiral separation using SFC/MS/MS, after having selected an appropriate column. The applicability of human plasma matrix to SFC was evaluated taking an example of the enantiomeric drug omeprazole, well-known as a proton pump inhibitor. 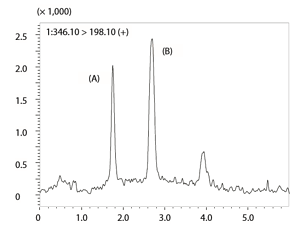 Detection was performed using the LCMS-8050 triple quadrupole mass spectrometer. Rabeprazole, known as a gastric acid secretion inhibitor, has a similar chemical structure to omeprazole, suggesting the possibility of successful chiral separation under similar analytical conditions including the same analytical column. Here, an attempt to analyse rabeprazole in a plasma sample based on the analytical conditions used for omeprazole was made. Analysis was successful by merely changing the modifier concentration and the MRM settings. The recovery rate was near 100% and good repeatability was demonstrated. The results suggested that pharmacokinetic studies requiring chiral separation can be greatly facilitated by using SFC-MS/MS in terms of robustness, throughput and sensitivity.